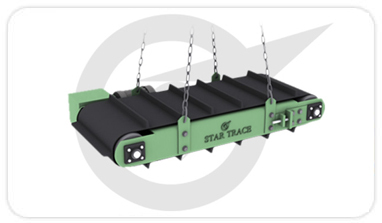 STAR TRACE's Industrial Over band Magnetic Separators have been developed to handle high volume product stream flows that exceed the limitations of standard permanent suspended magnets. These models are available in both, manual on/off or automatic, self cleaning system designs. Electrical Power Supplies to operate the magnets are also available and recommended to ensure proper electrical power is supplied to the magnet. Two U-section pieces are fixed on the Magnet by fastening ears and are supporting bearings of Drums. Drums are equipped with shafts mounted on removable hubs. All bearings equipped with stakes for tightening the belt. The belt is driven by a Reduction Gear Coupled to Electric Motor or Geared Motor by Vee- belts. The Magnet is made of High Intensity Strontium Ferrite Magnets and is guaranteed for the Magnetic Power throughout the life of installation. A Non - Magnetic Stainless steel Plate is provided to cover the poles of Magnet. There is no need for any electrical supply or maintenance. Permanent magnetic suspension separators are made with powerful Strontium Ferrite magnets. Most effective for removal of tramp iron from materials carried over conveyors/ vibratory feeders or inclined planes. Can be suspended for Longitudinal or Transversal cleaning over the conveyor belt. Available in widths from 16" to 90"
Permanent Industrial Overband Magentic Separators are made with powerful Strontium Ferrite magnets and supplied for deep depth up to 300mm. Manufactured to suit conveyor width. 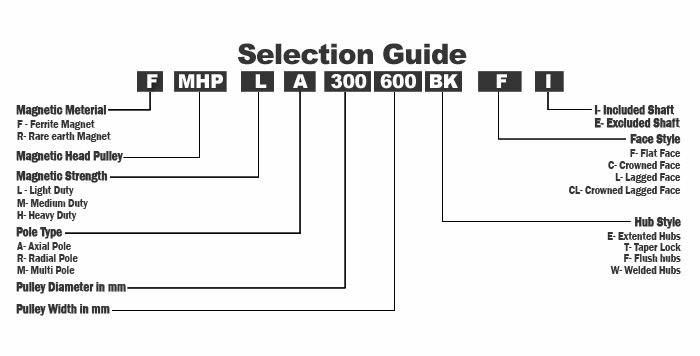 1.Technical data specification subject to change. 2.Special Industrial Overband Magnetic Separators can be made on request, Please send us your technical data and application, required for our engineers to provide. Star Trace Private Ltd. India. Copyrights © 2019. All Rights Reserved.